Today we are looking closer at what Kaipa has to offer this time, almost three years after their latest effort. Children of the Sounds is the name of the new creation by Hans Lundin and his Kaipa, and it certainly looks good from the graphic point of view. I can certainly claim that I had high hopes for this album when taking it on considering that the previous albums had received high praise in my reviews and I have been listening to this band for quite a while now. And you don’t really need to listen long to realise that this is another brilliant effort from these guys – an album that will not disappoint, the fans will recognise the band but still find this a fresh and exciting new effort. It is all about progressive rock music of the melodic kind, with exciting atmosphere including all kinds of exciting influences. The production is excellent, the vocals are great, as is the drumming, the guitars and keys are also very exciting, the soundscapes produced by Kaipa bears their distinct trademark sound but also moves them on in their musical quest for the edge of new horizons. With long songs, only five of them playing for an hour, they make their music a bit less accessible for the general audience who see music as a background thing when doing whatever it is they are doing, this is music you should really listen to, and enjoy. So, it may not really be for everyone, but none of the greatest music really is. Children of the Sounds is an album without any weaknesses and if I really were to point one thing out it may be that the album is more or less exactly what I had envisioned when I first received the promo mail, there are no real surprises. 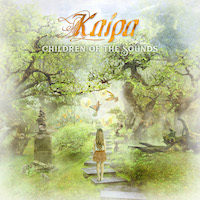 It is still a very fresh album though, an album that moves Kaipa further along their musical path of excellence. And they will not disappoint this time either as they have managed to put together five really great tracks that takes you on a very exciting musical adventure, an adventure that will take you wherever your mind decides to follow the music. It is also an album with a positive outlook, something that is very much needed in a world where many seem to see the worst in every situation. As alluded to before you probably understand that there are no songs that are very easy hit songs on this album, it is more about the atmospheres and adventures. And the best example of this on this album is the longest track called On the Edge of the Horizons, which is a wonderful musical adventure. I also like the ending track called What’s Beyond the Fields a little bit more than the rest but all the songs are great, leaving me with the conclusion that this is another triumphant album in the great career of this band. I think you should check this album out, you will not regret it.